Healthcare is a complex ecosystem of diverse professions that often work in silos rather than in tandem. To foster interprofessional communication and collaboration, the first course in the online post professional programs at the University of St. Augustine for Health Sciences is IPE 7000 Introduction to Interprofessional Scholarly Studies. Although the course provides an orientation to student services and the online learning environment, it accomplishes much more. By bringing together clinicians and educators in the Doctor of Education (EdD), Doctor of Occupational Therapy (PPOTD), Transitional Doctor of Physical Therapy (tDPT), Master of Health Sciences in athletic training and informatics, Master of Healthcare Administration (MHA) and nursing programs, it creates an interprofessional dialogue on timely case studies and ethical issues. For course discussions, Dr. Herrington has 30 years of experience as a nurse in emergency departments and other settings to draw from, as well as advocacy work at the state level in Kentucky. She also has taught for several universities and been an online student balancing work and school. Work-life balance is another important part of the course. 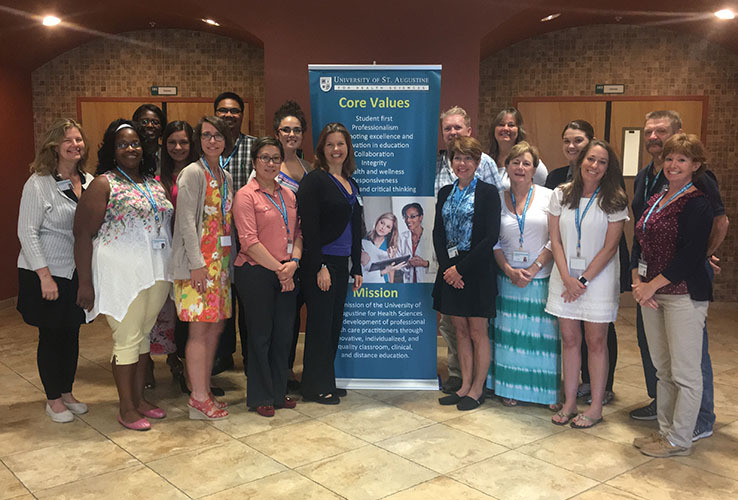 “Early in IPE 7000, students create a work-life balance plan that makes sure they are still a mom or a dad, that they can still provide care for their parents, and that they balance their personal and professional lives while learning the skills to improve the outcomes of their patients across the healthcare continuum,” adds Dr. Herrington. Toward the end of the course, students can choose to continue online to the end of the term or complete the course early by attending a weekend residency on campus. Many choose the residency option, but student surveys show they do so not to complete the course quickly, but rather for the face-to-face time with their peers, faculty, and advisors, as well as for the course content such as a presentation on scholarly writing. “At the end of the summer residency, students created their own Facebook group so that they could continue to have dialogues throughout their individual programs,” says Dr. Herrington.